Join the Farm for the monthly (3rd Sunday) gathering to work together growing organic vegetables and herbs. Harvest for the weekly Sunday farm stand, prepare beds, plant seedlings, weed, mulch and enjoy our green oasis in the heart of the East Bay. 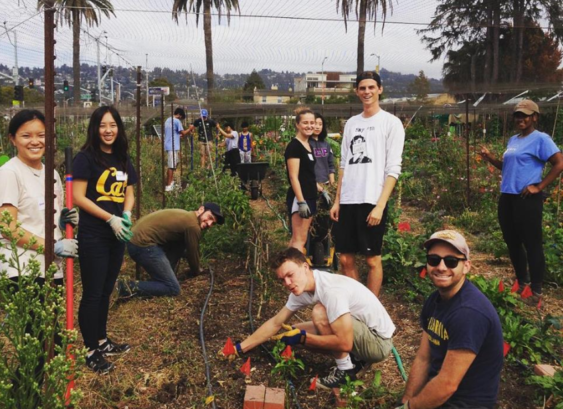 Get your hands dirty, and hang out with the community while cultivating and nourishing the fruits and vegetables that feed help feed the bay area. Create new relationships with local community members, spread happiness to the neighborhood and the earth, and promote positive change for the environment. Share a potluck lunch with fellow farmers and learn about the growing urban agro-ecology movement, creating healthy environments, and promoting food justice. *Dockside tours are technically free, but a donation of $5 is appreciated. Sailing tickets start at $65. *The first 50 RSVP guests get an extra Bunny Decoration Kit. *RSVP highly encouraged to make sure we have room for you. *Free to watch; but $10-$20 suggested donations are requested to race.